Oh Liberty of London. I wanted to believe your fabric was not worth the crazy high price. That it was just the name and not really that nice. But this week I had my first chance to make a garment and I’m a believer. 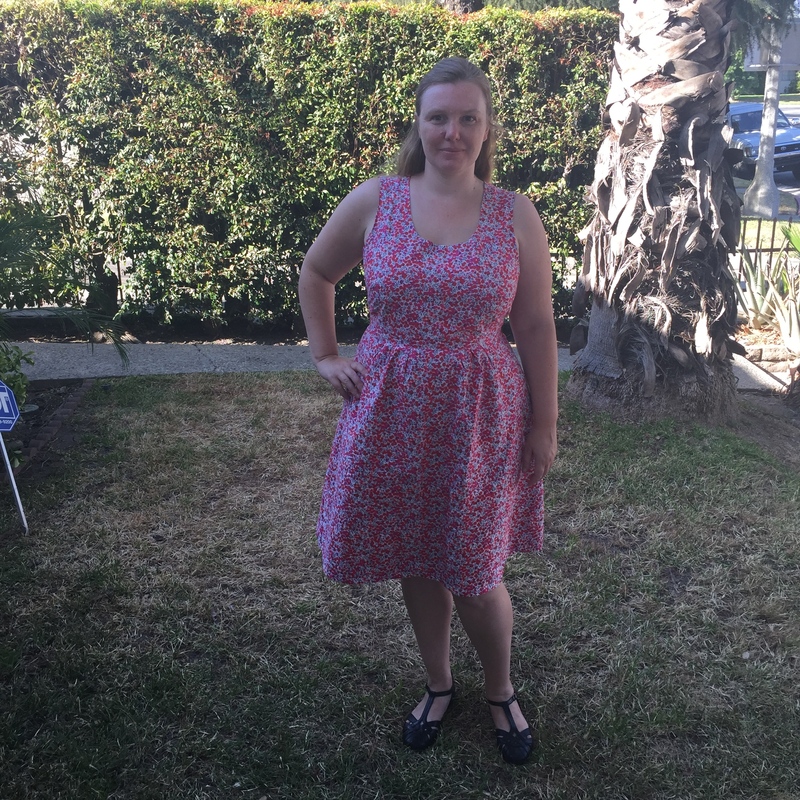 Oh and maybe you have heard of a sewing pattern called Washi Dress? It might have been featured on a blog or two or perhaps about a thousand. Forgive me. I’ve been busy having babies and am just catching onto these trends! Anyways, a few months ago I opened my Liberty Club package from Westwood Acres and gasped when I saw the top fabric on the pack. It was the Whiltshire pattern in color way S. A classic, but new to me! They offered a discount to club members who wanted to purchase yardage, so I took advantage to purchase 3.5 yards, the recommended yardage for Washi in an XL. And I love it. The combination worked so well. 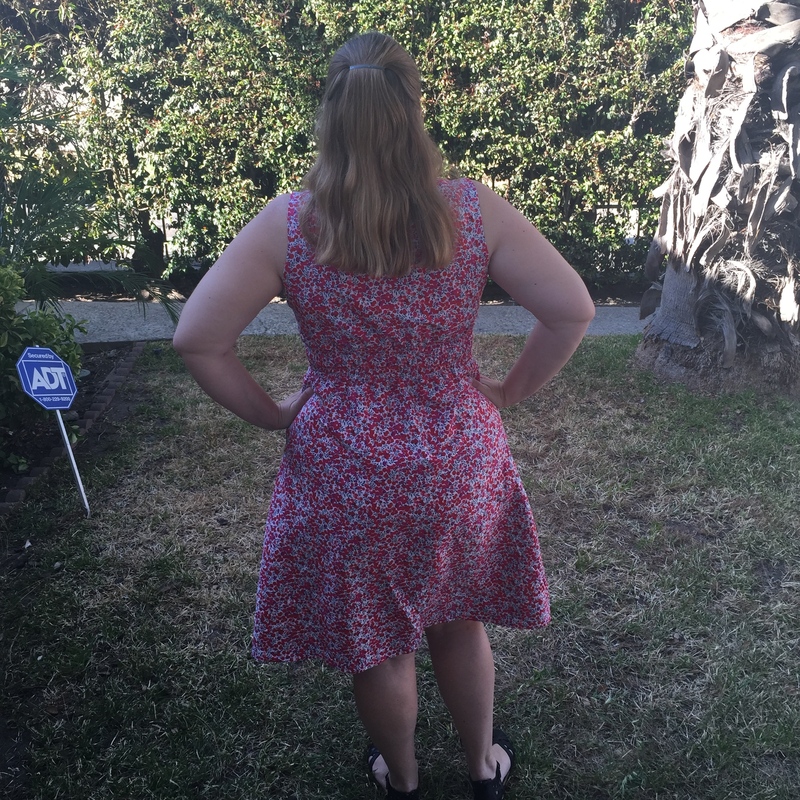 Because Liberty is 53 inches wide I was able to cut the pieces on the cross grain and fully line the entire dress with the 3.5 yards. Fully self lined. Luxurious. 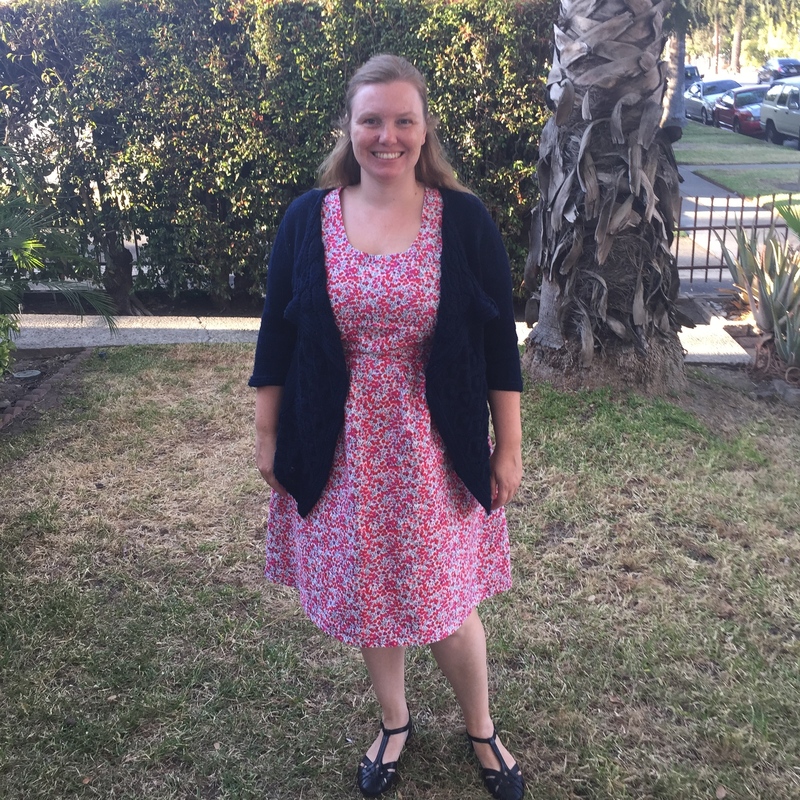 And after wearing nothing but knit dresses with a cross over front for the last oh…10 months, it feels amazing to wear a regular dress. A-ma-zing. Plus all the shirring in the back highlights the fact that I do still have a waist! Of course I did have to make a few alterations. I did a 2 inch FBA, lowered the bust dart 1 inch, added 1.5 inches to the bodice length, and added about 1 inch to the hips. All of these alterations were relatively simple and made the Washi pattern into something that will be incredibly versatile for my life. Casual enough for the weekend, but nice enough for the office with better shoes and my favorite sweater. Looks like I might need to make a sway back adjustment next time, but this is still a solid start. Okay, maybe the sweater isn’t the best shape, but oh so soft and a perfect weight for LA. And I just put buttons on a new cardigan today. Perhaps it will suit the shape a little better. We’ll see. But my main take away from this project is that 1) shirring is so damn easy and 2) Liberty is worth every penny. These pictures were taken on a hot day when I’d been running around and sweating and it did not wrinkle a bit. Magic.